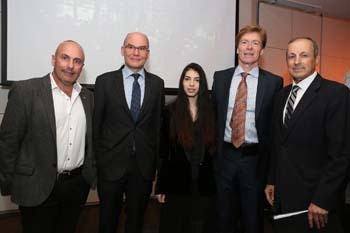 Representatives from many communal and religious organisations, including the Consul-Generals of Austria, Germany and Greece gathered at the Sydney Jewish Museum for the New South Wales Jewish Board of Deputies’ (NSWJBD) annual Kristallnacht Commemoration. 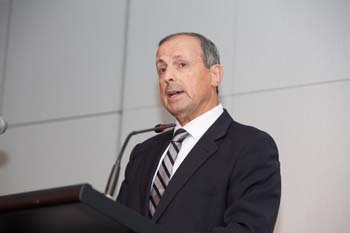 Danny Hochberg, Chair, NSWJBD Shoah Remembrance Committee welcomed the 300 guests and said that Holocaust survivors victims and survivors will continue to be honoured. On 9 November 1938, the first Nazi-legislated riots against Jews took place in Germany and Austria, resulting in mass arrests, killings and deportations, and the destruction of synagogues and Jewish-owned stores. 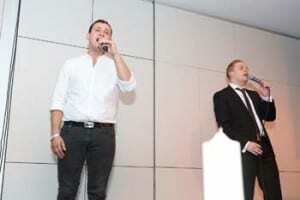 “It marked the democratisation of violence against Jews. Let us use this day, not only to commemorate but to pledge to be vigilant so that this will not happen again” said Hochberg. A short film of the testimonies of Joachim Schneweiss and the late Gerald Levy in which they spoke of their memories of living as boys in Germany and how they were affected was shown. Robyn Bloom, daughter of Gerry Levy, spoke about her father’s life in Magdeburg, Germany as a young man where the Jewish community was 1000 years old. He had enjoyed a happy early childhood until the age of nine when race laws changed everything for German Jews. Humiliation was a regular occurrence as everyday freedoms such as travelling on a tram were taken away. 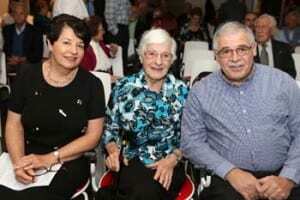 Gerald and his family were fortunate to be accepted as refugees in Australia and arrived in March 1939. 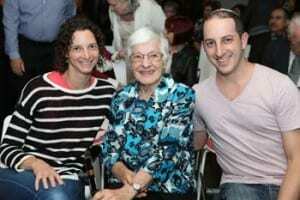 Her father became very involved in Jewish community activities in Sydney and in 1994 his contribution was recognised with the award of Order of Australia. 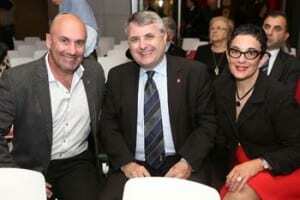 On receiving his award from the NSW Governor Peter Sinclair, Levy said to the Governor “that he had never dreamt that a ”reffo” boy could attain such distinction. 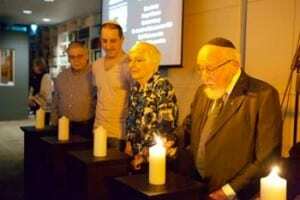 Memorial candles were lit by Erna Levy, Robyn Bloom, Sybil Schneeweiss, GeeJay Schneeweiss and Joachim Schneeweiss who recited Kaddish, the mourners’ prayer. Introducing keynote speaker, Cheryl Koenig , Vic Alhadeff, CEO, NSWJBD, outlined her many achievements including a lifetime award for outstanding commitment to community and NSW Women of the Year in 2009. 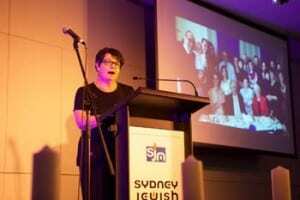 Cheryl Koenig, a Sydney writer and motivational speaker, sees herself as a child of mixed culture with a Jewish Romanian father and a mother who was a 4th generation Australian-born Catholic. “Chicken soup with matzo balls and Vegemite sandwiches” is her description. While raised a Catholic, she was exposed to significant Jewish occasions such as Passover at her grandparents. “What disturbs my understanding of our common humanity, is who or what kind of society would allow the political and social bacteria of such times – and the cultural indifference – to fester unabated, leaving blameless individuals to suffer the unimaginable. Where were the good people’s voices? 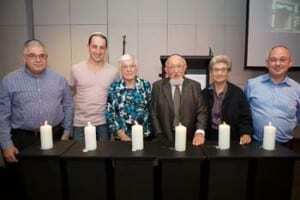 “The unspeakable horrors Holocaust survivors endured, ones that we still wince at today, are impossible to imagine. The horror and brutality leave me shamed to be part of a species that could commit such wrongdoing. However, there is also a sense of wonder in understanding how those persecuted and subjected to torture and annihilation of family members could possibly stay intact – stay human – and create new generations of ‘hopeful’ human beings. “But valour, daring and imagination form only part of the mosaic that has combined to create a successful representation of life for the many refugees that continue to grace our sandy shores. Hope and resilience were, and are, of equal importance – creating aspirations; a faithfulness to keep hold of the dream, and eventual accomplishment. 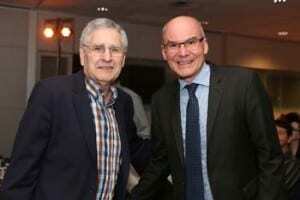 “ I used to think it was the big events that defined history, but I’ve learnt it’s not. It’s the people. The good people who use their voices against prejudice and the hopeful who choose resilience over submission” said Koenig. 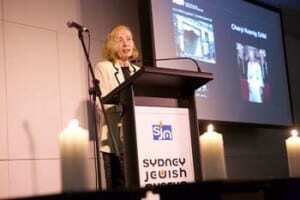 In his closing address, Jeremy Spinak, President, NSWJBD, said for many Jews in Germany, the night was the point when “violent rhetoric, racist laws and largely disorganised and vigilante harassment became an organised, state-sanctioned murder”. “Kristellnacht is the occasion when we remember the victims of the night and also remember the 6 million people who were soon to tragically follow. 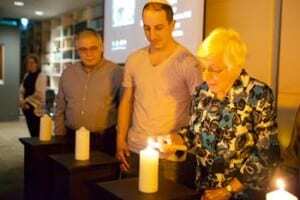 “Jews all over the world have taken a pledge to never forget and we will not let the lessons of Kristellnacht or the Shoah go unlearned, or take for granted the events that led to that fateful night. “We will be forever vigilant and fight anti-semitism and will not tolerate it even in small forms so it never becomes accepted as normal”. That is why we take today so seriously” he said. 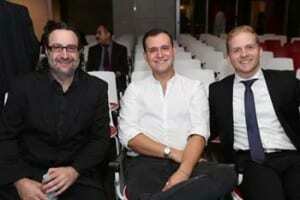 Cantor Josh Weinberger, David Politzer and Robert Teicher provided moving musical tributes. Australia’s B’nai B’rith Anti-Defamation Commission notes that this barbaric event still carries many important lessons for today, most importantly that we can ill-afford to close our eyes to anti-Semitism and to any radical ideology. The ADC stated that Kristallnacht is a potent reminder of how evil can proliferate if left unchecked, and how vital it is to fight the scourge of anti-Semitism and other forms of intolerance and discrimination wherever they persist. Dr. Dvir Abramovich, Chairman of the B’nai B’rith Anti-Defamation Commission, said: “As we join millions of people around the world in sombrely marking the 77th anniversary of the horrific Nazi pogroms of Kristallnacht – “the Night of Broken Glass”– let us remember that the enduring lesson of this dark and monumentally tragic night is that we must always speak out against anti-Semitism, extremism and intolerance.